Many people think that being vegan is difficult, but nothing can be farther from the truth. In the modern world, grocery stores are packed with choices that can satisfy the most stringent of plat-based health enthusiasts and the vegans who only want to eat mock meats and junk food. There are plenty of options to go around. This vegan grocery list will show you a plethora of options and make shopping a breeze! I’ll also give you some pointers along the way that should be helpful for beginners and experienced vegans alike. If you’re new to being vegan, embracing your beans and legumes is a great place to start. 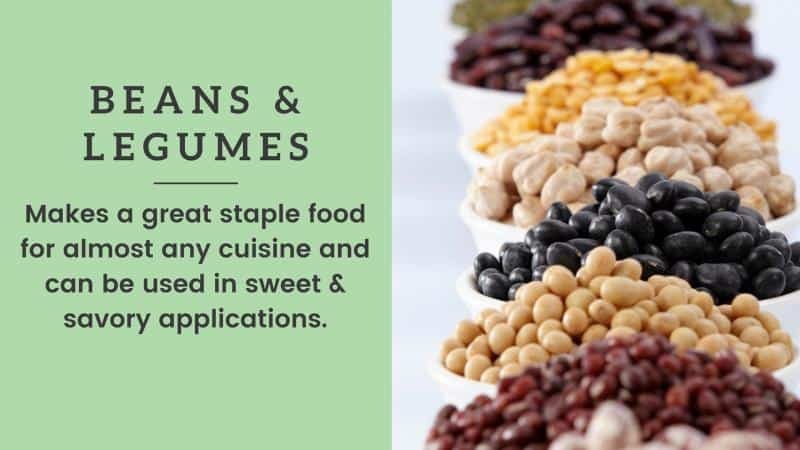 They’re packed with fiber, protein and complex carbohydrates that will keep you full and satisfied for long periods of time, and they are versatile enough to be incorporated into many different kinds of dishes. Black Beans: These are slightly firm and are always nice to have on hand for their versatility. Black Eyed Peas: Because of their color and harder texture, black eyed peas are ideal for making things like Cowboy Caviar. Mix them with diced green peppers, red onions, diced tomatoes and herbs, and you can’t go wrong! Cannellini Beans (or any white beans): White beans are slightly softer than the others and are perfect for Italian pasta dishes. Edamame (soy beans): You can buy frozen edamame in the freezer section and microwave for a quick snack or buy the shelled variety to throw into stir fries or Asian-themed dishes. Garbanzo Beans (chickpeas): Mash with some tahini and lemon juice to make a mock tuna salad or use a blender to make hummus! Kidney Beans: Their dark red color makes kidney beans a great option for adding visual appeal to a dish. Pair with grains, pasta or almost any vegetable. Peas: An extremely underestimated source of plant-based protein is the humble pea! Blend it up into a soup with some nutritional yeast (under the vegan cheese section) or enjoy it with some whole wheat pasta and marinara for a simple and satisfying meal. Many beans can be used in sweet recipes (like black bean brownies) as well as savory dishes. If you’re getting canned beans, be sure to get unsalted if you want to use them for this purpose to keep the flavor profile as versatile as possible. You can get beans in the bulk/dry section and cook them yourself without salt/preservatives if your diet requires. It’s cheaper this way, but slightly less convenient. A pressure cooker can make the process a little easier. Some can also be found frozen, like peas. You can use white beans to make an easy low-fat vegan cheese sauce with lemon and nutritional yeast in a blender. Depending on how starchy the root vegetable is, it can be used as a staple food or as a side. For example, you may want to use beets more as a side, but potatoes can be used as a staple food because they’re filling and have enough caloric density. They’re also neutral in flavor, just waiting to be seasoned with your favorite spices and additions. Beets (canned or fresh): Canned beets are a convenient way to add nutrients and colorful phytochemicals to salads. You can even combine them with chickpeas to make a red beet hummus. Carrots (fresh or frozen): Fresh carrots are ideal for dipping (like in that homemade hummus! ), and it’s always nice to have frozen carrots on hand for stir fries or mixing with pastas and grains. Sweet Potatoes (yams): Sweet potatoes can stay good for a few weeks, especially if you store them in the fridge. Cutting them into fries or cubes and throwing them in the oven with a little sea salt is a simple and easy way to make an impressive and filling side dish. They have tons of flavor and a varied texture without much seasoning. White Potatoes: Baked potatoes, mashed potatoes, roasted potatoes – need I say more? Pumpkin (canned): Eating pumpkin doesn’t have to be reserved for Thanksgiving. Incorporate it into soups, pasta sauces and dips for an added boost of flavor and nutrients. Squashes (any color): Squash is affordable and a great addition for soups, stir fries or even making breaded fries. Turnips: Best for winter soups, but turnips can also be roasted and mashed like potatoes. I find them to be slightly more starchy. Yucca: You’ll usually find Yucca in more Spanish-themed ethnic supermarkets. It’s a harder and starchier version of a potato. It can be sliced into fries or boiled. If you have an abundance of potatoes on hand, then you have a meal because there’s so much you can do with them! Bake a white or sweet potato and stuff it with beans and jarred salsa for a quick and filling lunch or dinner. Yucca makes great fries if you cut them up and top with salt and pepper. You don’t even need to bake it with oil for it to be delicious. Throw 1/2 cup of canned pumpkin and pumpkin pie spice into smoothies to create a warm fall flavor. Amaranth: A nutty grain that tends to have a stronger/nuttier flavor than the others. Use it anywhere you’d use grains and toast it first for maximum flavor! Barley: You don’t only have to use barley in soups. It’s a filling and nutritious grain that can be used anywhere you’d use rice. Buckwheat: If you’ve ever had “Kasha” from a deli, then you’ve had buckwheat. It’s a hearty grain that goes great with caramelized onions and mushrooms. Bulgur: Part of Middle Eastern Cuisine, it’s great for everything, but especially for making Tabbouleh. Corn: Corn doesn’t have to only be something you eat on the cob. Keep frozen bags of kernels on hand for salads or to use as a bed of grains. Farro: Farro looks like a darker and larger version of barley and makes for a great choice in hearty meals. Use it to stuff bell peppers, make burgers, make poke bowls or even soups. Oats: Cheap, easy to make, and delicious, oats should be a staple on anyone’s grocery list. Try mixing dried oats with bananas for easy 2-ingredient cookies. Rice (any color): While you certainly can use white rice as one of your staple grains (many of the longest living populations do), the colored rices are more nutrient dense – especially red and black rice. Quinoa: Light, fluffy and full of nutrients — you can use quinoa in almost anything. Even in a breakfast bowl with fruit, nuts and plant-based milk. The more vibrant and colorful your selection of veggies, the better! You don’t have to stick to anything that’s exotic and unfamiliar at first. Try to find ones you already like and perfect how you prepare them. Artichokes: Buy just the hearts and combine with spinach and cashew cream to make an artichoke and spinach dip or stuff the whole artichokes with vegan breadcrumbs and lemon juice. Asparagus: Great for any cuisine, but works especially well with stir fry or as a side for mashed potatoes. Broccoli: Much like asparagus, can be used for pretty much any cuisine you can think of and packs a nutritious punch! Brussels Sprouts: Shred them raw for a salad or bake them with some salt, pepper and liquid smoke for an easy side dish. You can even get fancy by tossing in balsamic vinegar beforehand for a more sophisticated flavor. Cabbage (purple or green): Cabbage is one of the cheapest and most nutritious vegetables out there. Try it steamed or eaten thinly sliced raw in a tahini slaw. Cauliflower: Such a versatile veggie that can be used for everything from buffalo cauliflower bites to blending into an Alfredo sauce or as a rice substitute for a low-carb option. Look for it whole or frozen. Kale: Kale can be used for a bunch of things, including salads and smoothies. If you want to eat it raw, try using your hands to massage it with tahini or avocado. This helps make it soft and makes the flavor more mild and enjoyable to eat. Bok Choy: This cabbage is ideal for making Asian-style soups or cutting and throwing into stir fry. You can even grill it whole because it’s so hearty. Arugula: Great for a quick topping for vegan pizzas or to add a peppery bite to a vegan bowl, arugula is a flavorful, versatile green. Bell Peppers: Perfect for chili, curries, or stuffing with grains, beans and even some mock meats, bell peppers are an excellent way to add both color and nutrients to your dish. Cucumbers: Salads are obvious, but you can also use sliced cucumbers dipped in hummus for a filling snack. Spinach (frozen of fresh): There’s many ways to eat spinach, but combining it with homemade cashew cream (just soaked cashews and water) is a quick way to make a steakhouse style creamed spinach — vegan style of course. Find a few green veggies you enjoy and focus on eating them on a regular basis. If you hate greens and have trouble eating them, try hiding them in a smoothie. You can really mask the flavor and texture when you combine with sweeter fruits like cherries or bananas and throw in some unsweetened cocoa powder. Don’t be afraid of the steam-able microwave bags for convenience. They’re perfect when you’re short on time. You can also get a microwave-safe steamer bowl which is great for cooking bulk-bought frozen veggies that don’t have a microwavable bag. Depending on the season, you should be able to find most of these fruits in your average grocery store. Buy bananas in bulk and freeze them when they begin to get brown. They’re perfect for banana ice cream or blending up thick smoothies. Get the berries from the freezer section. You’ll find that they are way cheaper and won’t have to worry about them going bad. Use Medjool dates along with cashews to recreate rich vegan treats like a plant-based cheesecake. They’re some of the richest ingredients in the whole-foods plant kingdom. If you’re a new vegan that’s transitioning, meat alternatives are extremely helpful. They allow you to re-create your favorite comfort foods without hurting animals. Meat alternatives can also help you overcome the mental barrier that you “need” animal products to get by. Tofu: Tofu is basically curdled soymilk that’s been pressed and formed into a block. Don’t believe the myths about it. It’s enjoyed by some of the longest living populations, including the Okinawans. Tempeh: Tempeh is a block of fermented soybeans that can pretty much be used anywhere meat can. It’s got a slightly sour flavor and a texture similar to grilled chicken with a bit more grit. Seitan: Seitan is known as the “wheat-meat.” It’s vital wheat gluten with some seasonings that’s formed into different shapes and textures to add protein and bulk to a variety of dishes. Pre-made Mock Meats: Brands like Gardein make frozen bags of mock pork, chicken, meatballs and more. Each have different flavor profiles and some have sauces for additional flavor. Veggie Burgers: Brands like Bubba Burger have veggie burgers that are made from things like oats and veggies. They aren’t “real” tasting, but still delicious. New “Plant-Meat” Burgers: Beyond Burgers and Beast Burgers are strikingly real and are great to throw on the grill. Mock Sausages: The sausages from brands like Tofurky are probably some of the most realistic mock meats out there. Enjoy them in stews, on sandwiches or any way that you’d use real sausage! Vegan Jerkys: Great for snacking, road trips or even used as fake bacon on sandwiches, vegan jerky is plain awesome! My absolute favorite is Primal Strips. When buying pre-made mock meats and veggie burgers, be very careful to check the labels. Some brands like Morning Star aren’t fully vegan and use eggs and dairy. Look for 100% vegan brands like Gardein. You can freeze tofu or tempeh, so feel free to buy in bulk. Tempeh is the healthiest of all the meat alternatives, but tofu isn’t bad either! Vegan jerky is fantastic, but you might only be able to find it online or at a Whole Foods. Be sure to try some of the new products as they come out. Items like the Beyond Burger are becoming all too real. If you’re someone who hasn’t eaten meat for a long time, it might even take some getting used to! Although most vegan cheeses aren’t the healthiest option, they’re becoming extremely close to the real thing. Brands like Chao even have the whole melting thing down! Nutritional Yeast: The go-to ingredient to make vegan food taste cheesy without anything that’s bad for you. Shredded Vegan Cheeses: You’ll be able to find several brands of shredded cheese like Go Veggie, Daiya and Follow Your Heart. Vegan Sliced Cheese: Some of the best brands of vegan sliced cheese nowadays are Daiya and Chao. There are more, but these are the ones you’re likely to find in the grocery store. Vegan Parmesan: The parmesan cheese made by Go Veggie is the most realistic vegan cheese I’ve ever tasted. I can almost promise you won’t know the difference – it even smells like stinky parmesan! High-End Fermented Vegan Cheese: If you’re lucky enough to live by a Whole Foods, Trader Joe’s or other non-conventional grocery store, you may be able to find brands like Miyoko’s kitchen that age and ferment cheeses made from plant-based ingredients. These are by far the best tasting, but rarest and most expensive. Pre-made vegan cheeses are great to have on hand, but it’s also easy to make your own healthier cheese sauces by blending soaked cashews, nutritional yeast, lemon juice and a bit of salt. For a lower fat vegan cheese sauce, you can replace the blended cashews with white beans or potatoes. Aside from honey, vegans can pretty much eat any and all sweeteners. Keep in mind, honey (especially from smaller bee farms) is a hotly debated topic in the vegan community and one I suggest you do your own detailed research on. *When buying conventional table sugar, it may be the case that non-organic cane sugar is filtered with bone char. To avoid this, simply buy beet sugar or organic cane sugar. If you don’t like stevia, try combining it with another sweetener or even small amounts of real sugar. It tastes best when used in synergy with something else. Flavored stevia drops also tend to be far less “stevia-tasting” but also add other flavors like vanilla, chocolate or hazelnut. Consider using sweet fruits like dates and frozen bananas to naturally sweeten things to get an extra boost of nutrients and fiber. Because fats aid in nutrient absorption, it’s important to eat them in moderation for most people. Some plant-based doctors advise against it for aggressive weight loss or for specific medical conditions, but this guide isn’t a medical one, so here are some great ways to get fat-based ingredients into your vegan diet. Nut Butter of Choice: An easy way to add extra calories and healthy fat to any meals. Just make sure you’re getting the “natural” nut butter and double check the label for things like sweeteners or palm oil. It should be 100% nuts. Flaxseeds: A vegan’s best friends for omega 3’s as it’s one of the richest plant-sources. You should strive to eat at least 1 tbsp per day. Put them in oatmeal, on smoothies or use it to make a flax-egg as an egg replacer. Be sure to grind them before eating! Chia Seeds: Great for making pudding, chia seeds can also be used where you would flaxseeds. Grinding them up into smoothies makes them super thick. Tahini: A sesame seed paste that is a great whole-food replacement for mayo, especially when mixed with lemon and onion powder. It’s used in hummus, but you can use it anywhere you need to add a little texture and richness. Sesame Seeds (raw or toasted): You can sprinkle toasted sesame seeds on almost anything to add a deep nutty flavor and crunchy texture. Vegan Butter (optional): There are so many good brands out there that you can use as a 1:1 substitution for the real thing. Don’t have the perception that it’s a health food, though. I recommend using it as a transition tool and eventually swapping it out for whole fats like avocado or tahini. Cooking Oil or Spray: A small drop of cooking oil can go a long way in preventing things from sticking. I like to use them very sparingly and stick to whole fats. The fats on this list that aren’t whole foods (vegan butters and oils) are generally agreed to be less healthy for you. I prefer to use them in moderation if at all. If you want to buy almond butter or another specialized nut butter, consider making your own at home because it’s far less expensive and you can ensure there are no unwanted added ingredients. If you eat a lot of Omega-6 rich foods (like processed oils), it is even more important to eat ground flax-seeds to keep your Omega-3 and Omega-6 ratios in check. There are so many vegan condiments out there that it’s difficult to list them all, but here are a few of my favorites and what I like to do with them. Soy Sauce or Tamari (gluten free soy sauce): A great way to make anything more salty while adding an element of depth rather than salt alone. Sriracha Sauce: A spicy chili sauce that goes well on almost anything. BBQ Sauce: Watch out for honey, but most BBQ sauces are completely vegan. You may want to make your own at home if you’re trying to avoid processed sugar, though, as many store-bought BBQ sauces are loaded with sweeteners. Mustard: I have mustard reserved for mashing with chickpeas, tahini and lemon for a tuna salad replacement. Ketchup: Use on vegan burgers or mix with vegan mayo to make a french dressing. Vegan Mayo: While traditional mayo contains eggs, there are vegan options that can help you add flavor to dressings and sandwiches. Buffalo Hot Sauce: Frank’s Buffalo Sauce is 100% vegan and great on almost anything, but beware of other buffalo sauces that might contain real butter. Jarred Salsa (red or green): If you’ve got a starch and a salsa, then you’ve got yourself a meal! Keep some jarred salsa on hand. Kimchi: Korean pickled cabbage that adds spiciness, savoriness and crunch to anything. Pickles: Everyone loves pickles. Try to find creative ways to use them outside of burgers and deli sandwiches. They can be a great addition to salads or even just a tasty treat on their own. Capers: Make great additions for salads. They’re kind of like condensed olives with a really strong flavor. Olives: Olives are very satisfying if you’re craving a fatty food. Use them in salads, eat on their own or blend them into a tapenade. Cacao Nibs: A healthier alternative to vegan chocolate chips as they’re a whole food with no processed sugar. They’re strong, but good once you get used to them. Smoked Paprika: An easy way to add depth and smoke without much thought to it. I put this stuff on anything besides Asian cuisine. Turmeric: Super anti-inflammatory and a great way to make things yellow. I use it to make tofu scramble! Garlic Powder: This universal spice can enhance the flavor of just about any savory dish. You can also find roasted garlic powder which is a bit less overpowering and has more depth. Onion Powder: Great when you don’t need something as strong as garlic and want to add a combination of savory and sweetness to your recipe. Vanilla Extract: The ultimate condiment for anything you make that’s sweet. I like to use vanilla to take oatmeal to the next level. Ginger Powder (or the whole root): I find ginger to be best used for Asian marinades or green smoothies, anywhere where you need something floral and uplifting. Basil (fresh or dried): Great for cold salads, flavoring tomato sauces or making a vegan pesto from scratch. Rosemary: Ideal for roasting veggies, combine with thyme to bring a Thanksgiving theme to any dish. Thyme: Thyme and rosemary go together like peanut butter and jelly, so you can use this spice in combination with rosemary or in similar ways on roasted veggies. Cinnamon or Pumpkin Pie Spice: Add to oatmeal, squash or smoothies to capture the flavors of fall any time of the year. Cocoa Powder (100%): A staple ingredient that can make anything taste like chocolate – even beans! Veggie Broth: A great way to add flavor anywhere where you might otherwise use plain old water. You can usually find little clam-shells of sprouts (not literal shells of clams) in the produce section. Sprouts are loaded with nutrients and are great for adding texture to almost anything including sandwiches, salads or vegan poke bowls. With a sprouting jar, you can have a near-endless supply of sprouts for pennies! Order one online or check your local gardening or kitchen supply store. If you’re health-conscious, be sure to buy the unsweetened variety of these plant-based milks. Some of the “regular” products tend to be loaded with processed sugar and extra calories. If you’re not supplementing B12 (you should) then make sure you’re getting a milk alternative that has B12 added. In my experience, soy milk is the best in coffee because it’s the most similar to “regular” milk in consistency and taste, but consider non-dairy coffee creamers if you like cream. You can use the raw materials, a blender and a nut milk bag to make your own at home. The coffee aisle of most grocery stores usually have plant-based options for creamers, even in a standard grocery stores, so be sure to check there. Also check where the shelf-stable creamers are for coconut-based powders. Nori: Nori is what your sushi is wrapped in. You can buy the sheets at almost any grocery store (or online for cheaper) and use it chopped up as an umami-boosting topping or wrap your own sushi. Dulse: Dulse is another type of seaweed that comes in flakes. You can use it in almost anything as it will add a nice savory flavor without being overpowering. Some of the best uses include sauces, salads, dressings and even to top popcorn. Kombu/Kelp: You’ll usually find kombu dried in long strips. It’s ideal for flavoring soups or even making a light salad with sesame seeds. Wakame: These are the seaweed flakes that most Japanese restaurants use in their miso soup. A little packet goes a long way as the flakes tend to become huge once they hydrate. One of my favorite restaurants uses dulse flakes in their vegan Caesar salad. Seaweed can be used in small quantities for a flavor boost without being “fishy”. Rolling your own vegan sushi with nori is easy after a few tries. The bamboo rollers don’t cost much and they last pretty much forever. If you’re so inclined, there’s an endless list of vegan junk food to enjoy. You probably don’t want to make these a regular part of your daily diet, but when the craving for delicious junk food hits, there are plenty of vegan ways to satisfy it. Here are a few of the most popular. Click the image below to get the full-sized printable version. Questioning The Dalai Lama: Who Would The Buddha Vaccinate? Stevia in any form does not feed cancer. It’s a plant /fiber. Why does this author list junk food and doesn’t even speak to avoid GMO’s or to buy organic? GMO, if not grown organic. The junk food listed here is full of GMO! Holy Wow! Oxy Moron here for healthy lifestyle? Not! stieva drops if it says drops do they cause cancer less ? ?